It's time to camp comfortably above ground in this Clipper Sport camping trailer. This model is easy to tow and easy to setup. You will be able to get a good night's rest on one of the two queen insulated tent beds after hanging out with everyone at the campsite. 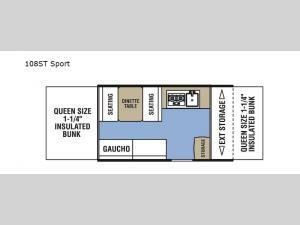 There is a booth dinette and a gaucho that provide a place to relax, eat, and sleep. You are sure to enjoy cooking meals and washing your dishes inside, but when the weather is nice, the exterior LP grill will be even more fun to use.